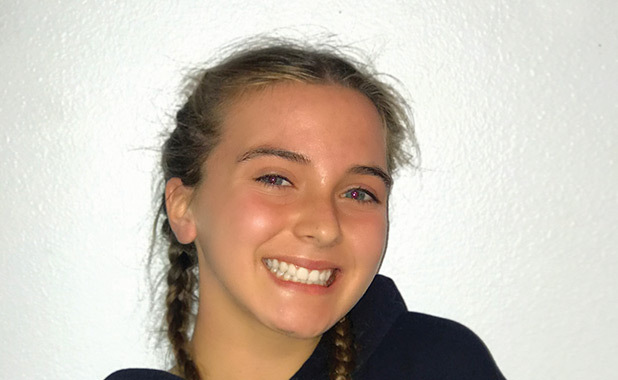 Bella Francisco is a 13-year-old eighth grade student at St. Theresa School in Palm Springs. In 2016, Francisco applied to compete on Food Network’s Chopped Junior as a way to earn some money to redecorate her bedroom. She was invited to compete and filmed her episode, “Let’s Taco ‘Bout It” in November 2016. Francisco completed the three rounds and won! Her episode aired in May 2017. Francisco has enjoyed cooking since she was about 8 years old. Her favorite things to prepare are baked goods and frozen-fruit creations. She maintains a dairy-free diet, having acquired a dairy allergy as an infant. She spent two years excluding gluten from her diet and thus has extensive knowledge in preparing gluten-free meals and baked goods. She no longer maintains a gluten-free diet. In addition to cooking, Francisco enjoys traveling, playing team sports such as basketball and club soccer, participating in Girl Scouts, and decorating her bedroom.